The first six semi-finalists of A Dal 2017 have been chosen. Ten acts battled it out tonight and left four eliminated. Meet the lucky top 6 from tonight and their entries. The Hungarian national selection A Dal was back today to select the country’s representative for the 2017 Eurovision Song Contest in Kyiv. Just like last year, the show will consist of three heats where ten acts will battle each week for a chance to move towards the semi-finals. Six acts will be picked each week. Following this there will be two semi-finals of nine acts each. Four entries from each semi-final will then move towards the grand final on 18th February 2017. Hungary has competed 14 times so far at the Eurovision Song Contest with their first entry being in 1994 with Friderika Bayer’s Kinek Mondjam El Vétkeimet?. The entry ended up in fourth place giving Hungary’s best placing so far in the contest. Since 2012, Hungary has been selecting their entries through the national show called A Dal. This has been a very successful move for Hungary as they have not failed to qualify for the grand final since introducing this format of selecting their entries. 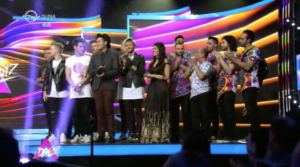 Check out Freddie’s performance below, which placed 19th in the grand final.